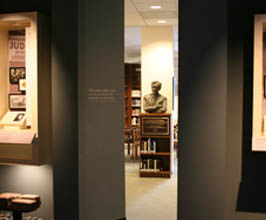 Entry to the reading room of the Sala and Aron Samueli Holocaust Memorial Library with bust of Nobel Peace Prize Recipient and Chapman University's Presidential Distinguished Fellow, Elie Wiesel. 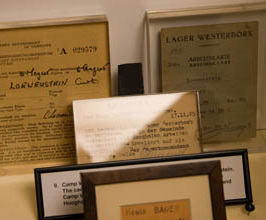 Gifted by Holocaust survivor and rescuer, Curt Lowens, this extraordinary collection includes artifacts and documents that span over nine decades. Docent-led tours of the permanent and rotating artifact and photography exhibits are available. 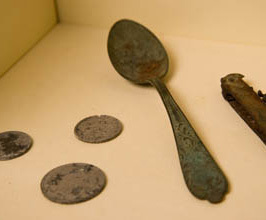 Visitors may also view the exhibits on their own. The library's permanent and rotating exhibits tell of the individual lives affected, and all too often ended, by the Holocaust. 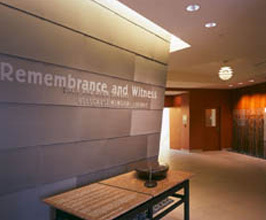 Dedicated by Nobel Peace Prize laureate, Elie Wiesel on April 11, 2005, the 60th anniversary of his liberation from Buchenwald, the Sala and Aron Samueli Holocaust Memorial Library is located on the 4th floor of the Leatherby Libraries. The library is a gift of Henry and Susan Samueli and is named in honor of Mr. Samueli's parents, both of whom were Holocaust survivors. It includes the Joyce and Saul Brandman Survivors Room, made possible by a gift from The Brandman Foundation. The library's permanent and rotating exhibits tell of the individual lives affected, and all too often ended, by the Holocaust. A child's shoe from the death camp Majdanek; a brief case used to carry false documents for Jewish children in hiding; a poem written by a boy in Terezin, all transform history into stories through which we can engage and learn. Recent gifts include the collection of Holocaust survivor and rescuer Curt Lowens and a self-portrait by Josef Nassy, a black expatriate artist of Jewish descent interned in camps in Belgium and Germany. The library's non-circulating collection includes photographs, documents, oral histories and books, including a first edition in Dutch of The Diary of Anne Frank, as well as reference works to support research on the Holocaust in its historical context. Photography of any items in the Sala and Aron Samueli Holocaust Memorial Library is prohibited without the prior specific written approval by Chapman University. Please contact the Director of the Rodgers Center for Holocaust Education for more information. To the extent permitted, photography is ordinarily for personal use only and may not be used for commercial purposes.